Once again your writing is so warm and well done, and as always so is the recipe. I can’t stop looking at the photographs. I’m hungry now! Have a wonderful week! It’s so disappointing having food experiences like that, especially when you expect so much more. Unsurprising that it makes you dream of simple, good home cooking. 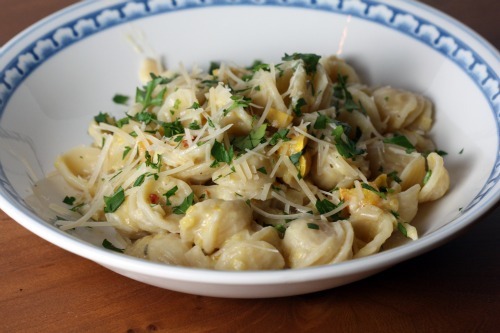 This pasta looks so good – I’d never have thought of leeks and squash together but it sounds so right! oh no! sorry to hear of your disappointment. 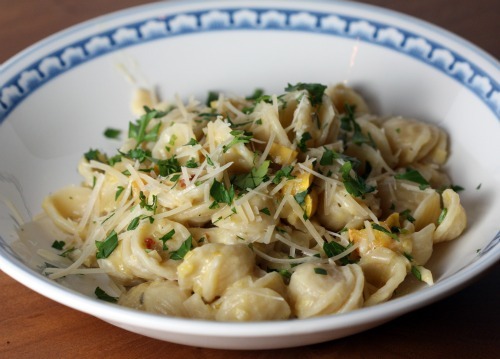 but i’ll say, i’d be dreaming of a pasta like this too. it sounds perfect. Sounds delicious! Glad you had such a sunny and relaxing week! Oy! I’m so sorry that you had a bad eating experience in the bahamas. I went there on a cruise a few years ago so I didn’t really experience local cuisine but the cruise food was…ugh…yeah I wanted to go home and drown myself in broccoli. This pasta looks glorious and like it more than makes up for any veggie burgers you had to endure! Definitely making this one! I’d like to eat that right now on this snowy day. Must be a shock for you after last week. What a relaxing, if not culinarily outstanding, vacation. Food can be so challenging when traveling as a vegetarian. Glad you soaked up some sun though! 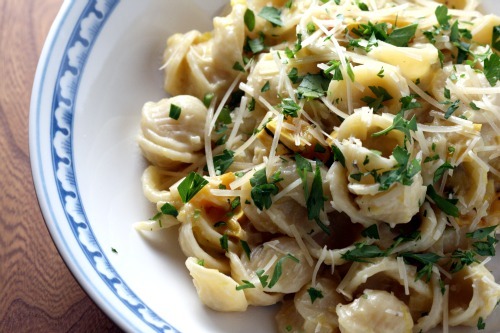 This pasta sounds so incredibly creamy and full of goodness, yum! I’d take a week away from mom/work duties if it meant eating *less than* food. But that’s because it’s been two years since I’ve had a PROPER vacation ;) Glad you are back, missed you around these parts. and HELLO! this dish looks fab. Putting it on my to do list. I cannot wait to make this!! Maybe I’ll get lucky and my CSA will have winter squash soon. This is my kind of pasta dish. Just divine. I use the pasta water trick too, it does help thicken a sauce. What a great holiday too, although I am sure you were really pleased to get back to your own kitchen. I bet your first meal once you were back tasted heavenly. Ohhh man..I knew it was the Atlantis!!!!! I’m so so so envious of all your travels! I’d love to be on a beach somewhere, though I’m definitely not interested in spending time in a resort – I’ve never heard anyone talk about the quality of food (mainly just the amount of food). But this dish sounds lovely and I’ve got leeks in my fridge right now just begging for something as comforting as this meal.